I saw a heart in the sky the other day, and I would like to wish all my friends and followers love and kindness in their lives. Lots is happening in the garden of course at this time of the year, wonderful things; strawberries ripen, some are eaten by the birds who then give us their beautiful singing in return. Basil mint is about the nicest scented mint I ever smelled, I am glad to have been given a pot of it. The empty beehive on the little roof in our next door neighbour’s garden has of today received a swarm of bees. We have to find out yet what type they are, they came buzzing around my head quite aggressively while we were drinking tea outside, so I wonder. The comfrey flowers got destroyed by a week of wind and rain and it is now all manure on some of the raised beds. There are but few flowers left in the garden at present but more are on the way to blooming. I think that there is something so nice about seeing clean linnen blowing in the wind outside, the will be so fresh when I take them in. But more importantly here is an small update of my experiment in plot 1 and plot 2. In Plot 1 the beans are finally growing better, they are well established and are climbing up the poles. The spinach on the other hand are bolting, though they are growing leaves too. There is a lot of wild plants growing in between the beans beside the spinach, the beans, and the radish (for the experiment). I have found double poppies and also borage plants which I want to keep so I am not touching them at the moment. In Plot 2, and there is a huge difference, there is nothing growing from under the leaf mould. I am still giving this plot seaweed fertilizer every week. I have sown radish there also. The bean plants are doing ok but they are only 42cm high whereas the ones in plot 1 are already 82cm high. So there is a marked difference between the two plots already. In plot 2 also I have found a few flowers on the beans. When not raining I give both plots water. I have also noticed that now that the leaves on the trees in the canopy above my two plots are throwing a huge amount of shadow – I think that this is interfering with the growth of my plants. And here in the following photos are some of the other vegetables growing such as asparagus, onion, marrow, rhubarb, chard, kale, leeks, orka, several different types of herbs, and finally runner beans and broad beans. If they all do well we will not be stuck for vegetables next winter. This beautiful Cinnabar moth was on the leaves of the lemon balm. I was given this lovely window hanger by my daughter, I like it very much. White and blue (in this case the sky) are some of my favourite colours. And so ends my present story of my garden. I’m in the garden everyday, planting out young vegetables and tending to seedlings. I love it very much. The birds are singing, blackbirds have nests quite close by and are feeding their young. I find that the closeness to the earth and the soil is what gives me solace and is what keeps me very happy indeed. I can only say one thing about it…. It certainly is magic! Your strawberries look delicous, i am afraid the birds are enjoying all ours before they are even fully ripe! At the moment our strawberries are quite hidden though because they are on the bed that is still overgrown, an advantage somehow. Thank you so much too Tish. Oh, a lovely post! 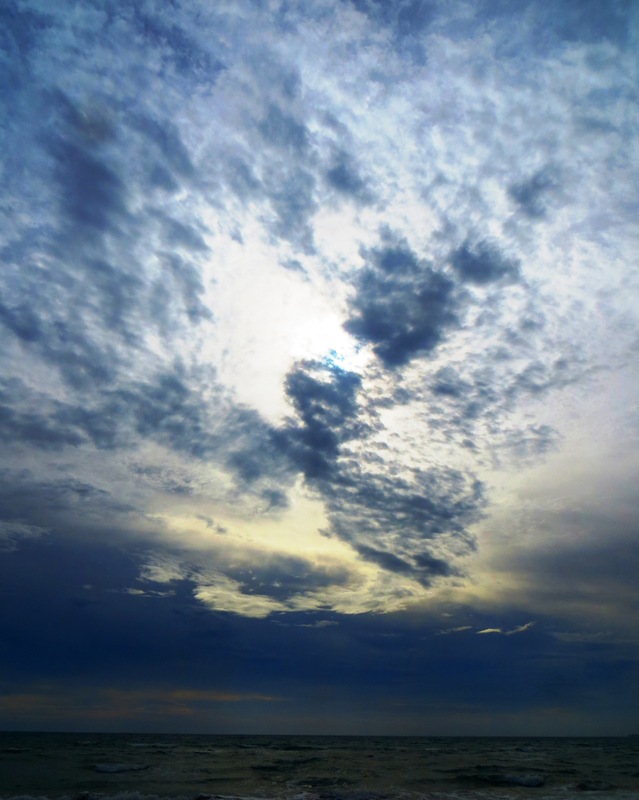 I love how you began and ended it with a white heart on a blue sky – quite clever! I love seeing your yard and your beds – also love to see the experiment in progress. And I’m with you about hanging out the laundry to dry. i always feel like it’s a good day when I take the time to do that rather than just throw it into the dryer. Thank you Jodie, I’m delighted you enjoy following my garden stuff. Always something happening in our gardens isn’t it 🙂 Have a nice weekend! That heart is beautiful! Yes, I agree, being out in the garden at this time of year is pure magic. Thank you Ali, very kind of you. A lovely post of a lovely garden, written by a lovely woman. I wish you love and kindness too! Thank you very much Viviane, and dat is wederkerig! Pure magic alright! Such a lovely post, loved the sky beginning and all your photos. I wish you love and kindness in your life too! Derrick they are so beautiful, I was delighted to spot one in the garden. Thank you for your kind comment. Lovely sky Andrew, yes cloud spotting is fun and interesting isn’t it. I learnt to do that even in school 🙂 But it is nice to spot an angel, I think we could do with a few more angels around the earth the way things are going. Thanks for your photo, I did not even realise we can put a picture in a reply – good to know. Dear Agnes, it was really so nice to visit your garden virtually. I felt nearly at home and I could see the love you feel for every plant. I specially liked the moth, what a beauty! And kind regards to you too dear Mitza, thanks for your kind comment and wishing you a lovely and sunny weekend as well. Dear Agnes, you look so happy and you spread your happiness! This is a gift, a very lovely and warm post! Take care and enjoy your happy world! Thank you for your kind comment. What better to do but spread the happiness if you are happy 🙂 glad that it reached you too. Enjoy a beautiful evening! Can you remind me what you are doing with Plot 1 and 2 – are you going for polyculture vs monoculture or something else? Most people seem to be struggling with the GROW experiment, as it has been so dry. I’m not doing the experiment due to lack of space but my traditional Three Sisters seems to be going okay for once! I’m glad that you are so familiar with the GROW experiment Helen, we are on the same page. I decided not to do the actual GROW experiment this time also due to space mainly. So I made my own experiment based totally on what I learnt in the course “Citizen Science: Living Soils, Growing Food” and used their methods etc. But my experiment is to see the if it is more beneficial to make my soil more fertile using my own compost from the bin (plot 1) versus using leaf mould and organic seaweed fertilizer (plot 2). My hypothesis is that my compost would probably be a better improver. So far, and I had trouble with slugs first and I guess it has been warmer during the day than normal for the time of year here. French beans seem harder to grow here in West Cork. So there are all sort of variables, and one wonders how scientific my outcome will be. Also it turned out that my soil is lacking in nitrogen and phosphorus and I have not really addressed that to date. All very interesting Helen. Glad to hear that you Three Sisters are doing okay, I have not tried that so far but one of my bean plants (runner beans) has wound itself around a nearby Jerusalem artichoke 🙂 I’m letting it be! I think there is a bit missing from one of your sentences – are you so far unsure which plot is performing better due to slugs and higher daytime temperatures? Yes, it will take till the end of the season before I can look at all the results and decide what is the best to use to improve my soil – seaweed fertilizer or my own compost from the garden bin. Of course, no way you can know yet. Unfortunately, my experiment to see if the rhubarb patch will be more productive because of bokashi fertiliser and mulching with pine needles looks like being scuppered because of lack of rain fall. That would have been very interesting too Helen, you might save it yet, let us know what happens. Wat een fantastische post en wat een fijne tuin heb je. en w<at een prachtige vlinder.Is het een nachtvlinder die ook bij dag vliegt?